SHAHPH PUMA EDUCATION (Division of Shahph Puma Sports Club) proudly hosts the3rdAnnual Math competition for kids from Grade 2 to Grade 8. Hey kids, do you want take a challenge! 1st, 2nd, 3rdplace winner will receive cash price. Please like club Facebook fan page and get new update instantly in your wall paper. 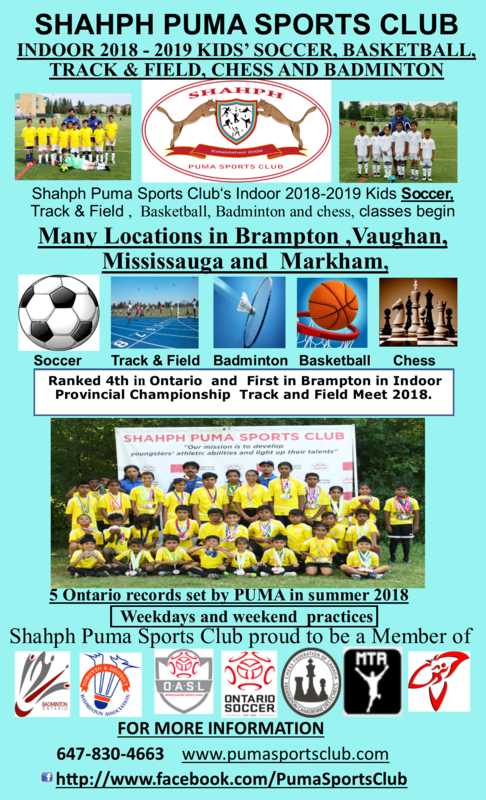 Shahph Puma Sports Club‘s indoor 2018-2019 Soccer, Track & Field, Badminton, Basketballand chess begin. 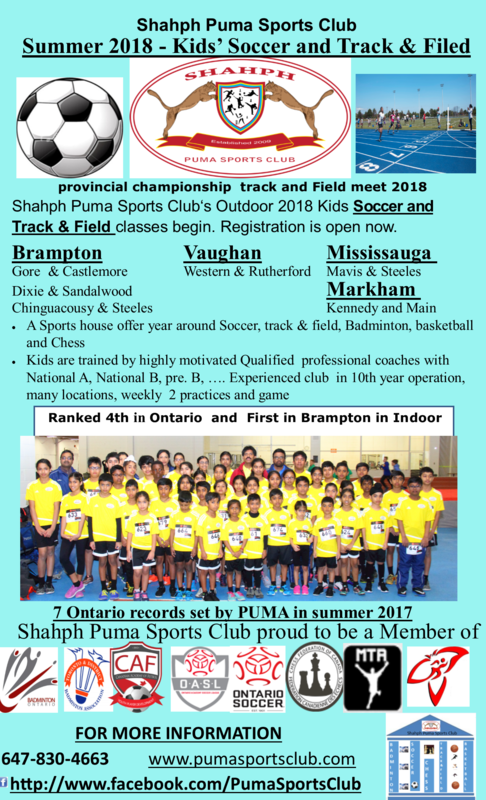 Shahph Puma Sports Club‘s outdoor 2018 Soccer, Track & Field, Badminton and Basketball season begin. 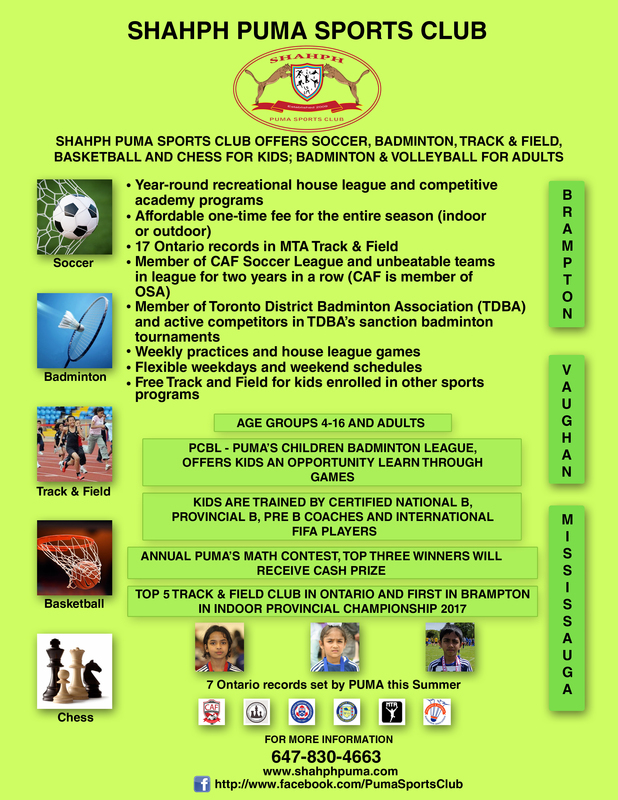 Why shahph puma sports club? 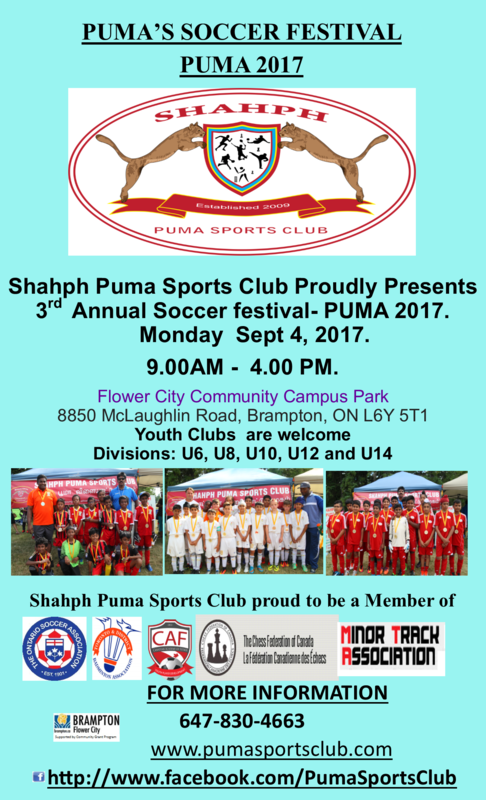 3rd Annual Soccer festival- PUMA 2017. Click the linh HERE to download the appliation form. We are accepting registration for Soccer, Track & Field, Badminton, Chess and Basketball. Selected top-level soccer players in academy program with very high potential and aspirations are playing game on Sundays in CAF league, who are part of OSA ( CAF- Canadian Academy of Futbol) . Selected top-level High performers in track and field will be participating in provincial meet run by MTA ( Ontario’s Minor Track Association. Registration closing date is Nov 6, 2016. Date: Saturday August 27, 2016. Time: 9:00AM - 5:00 PM. Location: Terry Fox Track and Field Stadium. 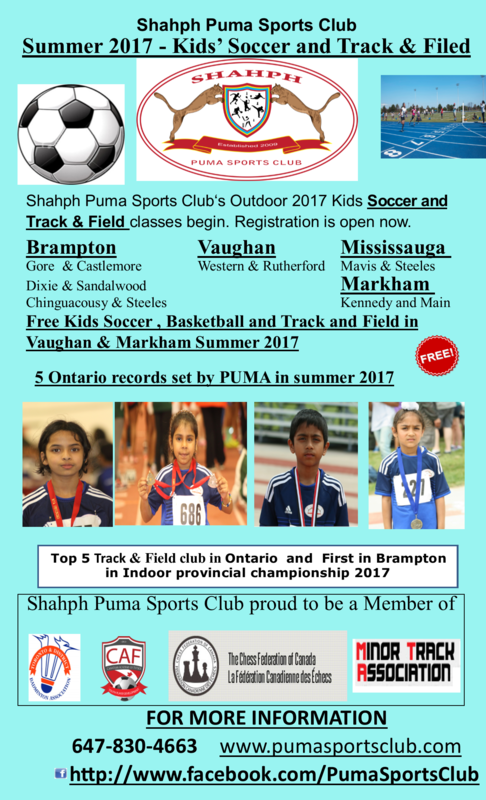 Shahph Puma Sports Club's summer outdoor Season starts. We offer soccer house league and academy program for kids based on their skills. We are accepting registration for Soccer, Track & Field and Basketball. We are happy inform you that as of Jan 2016 we will be offering Basketball practice in Vaughan location. Congratulations to all participants and 1st, 2nd, and 3rd winners. 1. 1st, 2nd and 3rd place marks will be released in the Xmas party and award night on Dec 19, 2015. 3.Kids participated in the previous years could use the same index number. Sorry to inform, due to permit issue I have to postpone the math contest to Nov 8, 2015. Sorry for the inconvenient.. Please click button to check the indoor schedule and locations. The following programs offered in our Brampton, Vaughan, Mississaguga and Markham. 2014-2015 kid's Indoor soccer starts. We will give first preference to our existing members to register first week and remaining spots will be given to new members form next week. 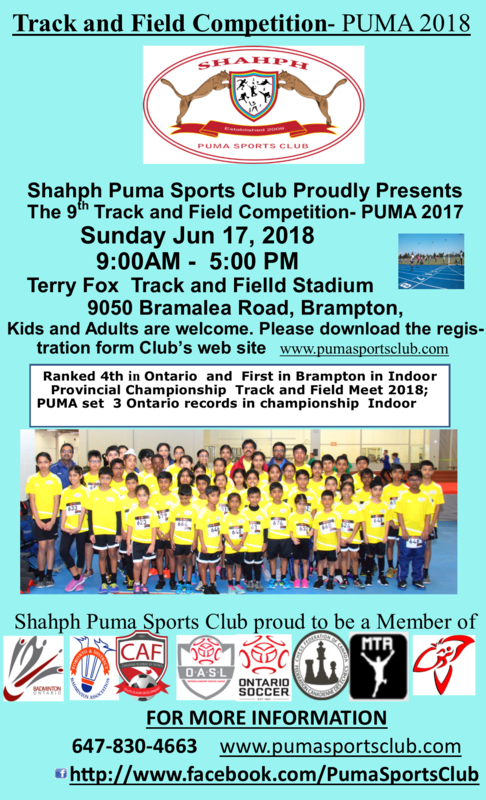 SHAHPH PUMA EDUCATION (Division of Shahph Puma Sports Club) proudly host the 2nd Annual Math competition for kids Grade 2 to Grade 8. 1st, 2nd, 3rd place winner will receive cash price. Please find Sunday's Apr 6, 2104 Badminton Tournament Tentative schedule. We will try to follow the schedule below, please note it is a tentative schedule. - Please give extra time and arrive 15 minutes before the game start time. Please join us for the Math competition awards ceremony on Saturday December 14th at Sandalwood Heights Secondary School from 4.00 – 5.00P.M. All the kids who wrote the exam are invited for awards ceremony along with their parents. Please note: The prize for 1st, 2nd and 3rd place winner will be given after the dinner along with sports awards around 10.30P.M.. Please note: We will be having our Christmas party and Sports awards night after MATH Awards presentation. We cordially invite you to join us to the fun full night. Dinner will be served. Entrance fee for the family is $45.00 and Single ticket is $15.00. All current & past members (kids and parents) of the club, sports meets, Badminton tournament and math competition participants and friends and relatives of the club members are invited?. The Shahah Puma Sports Club will be celebrating its 4th Annual Christmas Party and awards night on Saturday December 14th at Sandalwood Heights Secondary School from 4.00 P.M. – 12.00.A.M.. Kids are encouraged to do a performance of their choice (group performance preferred) for the entertainment portion of the night and if so then please provide the name(s), type of the performance, and length of the performance. The current/past members (kids and parents) of the club, sports meets’ participants, and Badminton participants, participants of math competition and friends and relatives of the club members shall attend the Annual Christmas Party and awards night. Agenda will be forwarded as soon as it is available. 2013-2014 kid's Indoor soccer starts. We will give first preference to our existing members to register first week and remaining spots will be given to new members form next week.Click the "Read More" button to see the schedule. I hope you all had a good summer break. 2013-2014 Indoor badminton starts. We will give first preference to our existing members to register first week and remaining spots will be given to new members from next week. Click the "Read More" button to see the schedule. Note1: No doorbell at the school, school entrance door will be kept locked all times. Door will be open just 5 minutes before each game someone. Please be on time. Sorry for the inconvenient. Puma Sports club invites you, your family and friends to club’s annual summer picnic on Aug 10, 2013 form 9:00 A.M. – 8:00 P.M. It is a whole day event loaded with lots of fun activities for all ages. As usual it is a pot luck lunch get together. Bring your favourite dish and best pot will be awarded. We will be having our picture day at the picnic (on Aug 10, 2013). Please bring your Jersey. Please check the club's facebook for update. 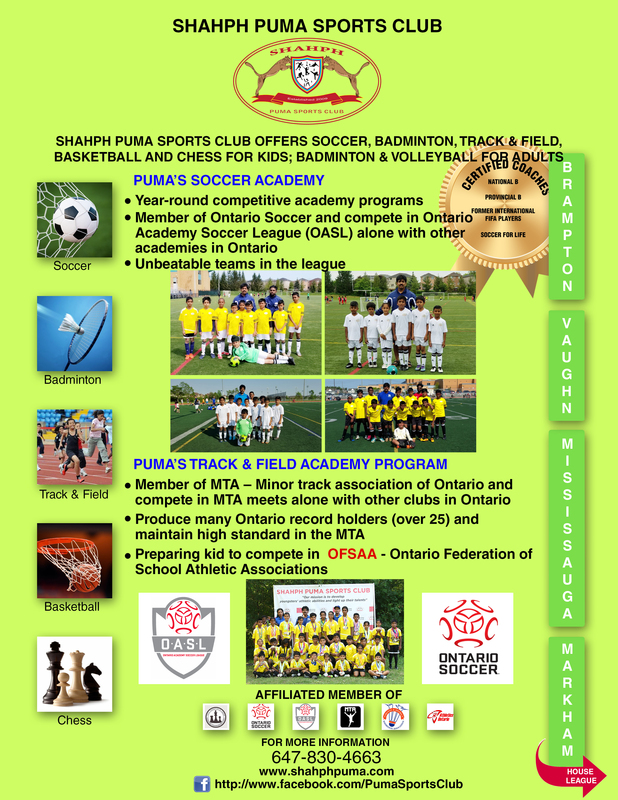 Shahph Puma Sports Club's Summer outdoor Season Soccer and Athletic classes starts. Accepting new registration now. We encourage all the players to participate in the house league games. 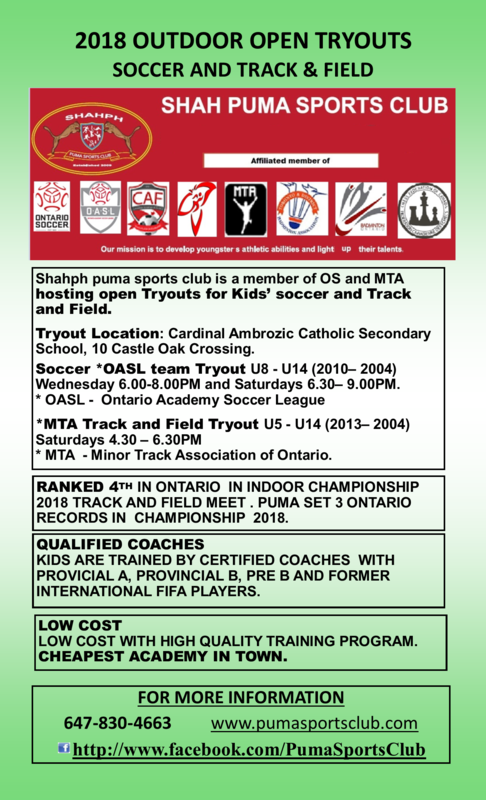 Shahph Puma sport club is member of DHSL (Driftwood Hispanic Soccer League) and DHSL member of OSA(Ontario Soccer Association). Please visit North York Soccer Association web site (link below) and then browse to Clubs and Leagues then select Driftwood Hispanic SC to learn more about DHSL. DHSL CONFIRMED CLUBS FOR THE OUTDOOR 2013 SUMMER SEASON. Start date: Regular season begins June 15, 2013. Times: Games are played on Saturday anytime 10:00 – 18:00 hrs. The following days there will be no games due to summer holidays: June 29, Aug 03 & Aug 31. Congratulations Rishi and Phriethan. Shahph puma sports club is proud to be developing talented youngsters. Rishi Krishan and Phriethan Mahalingam received Peel district school board Stellar Honoring student achievement awards on 7th of June 2012 for Physical and Health Education Canada School Recognition Awards for Quality Daily Physical Educations. Stellar is the event celebrating the success of Peel Students at the provincial, national and international level. Congratulations again Rishi and Phriethan. 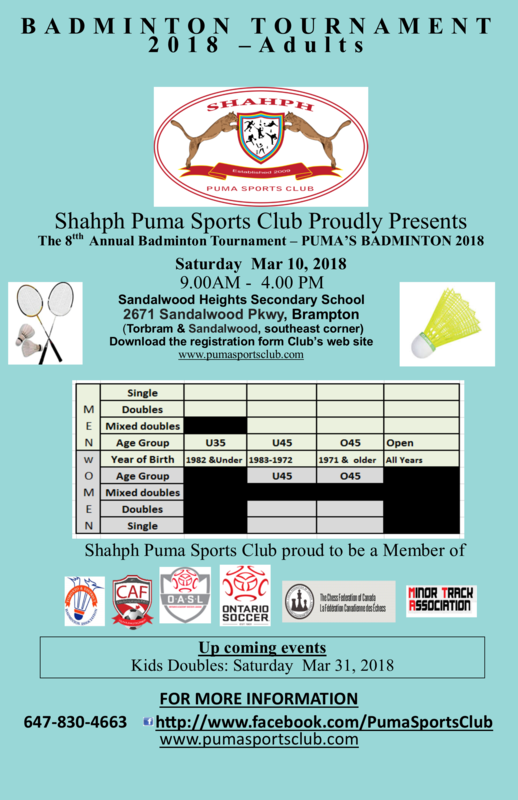 Shahph Puma Sports Club Proudly Presents The 1st Annual Badminton Tournament - PUMA'S BADMINOTON 2013. 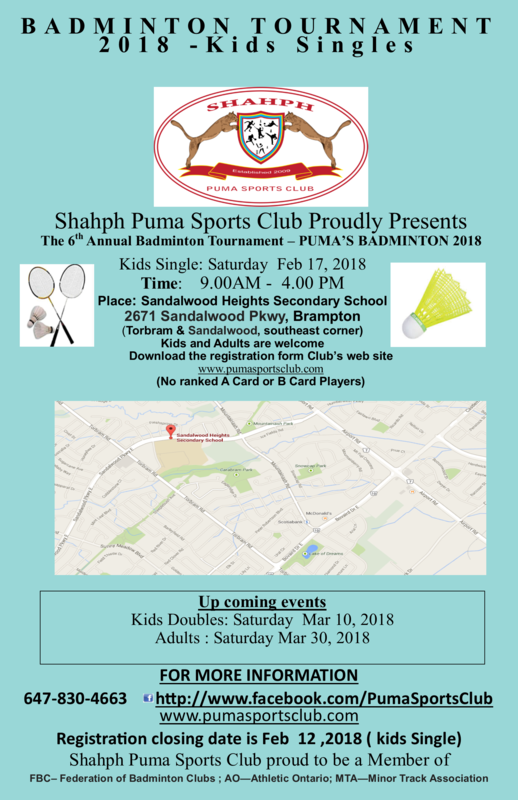 Another milestone achievement by Shahph Puma sports club the first multi-cultural Badminton tournament was a great success on May 19, 2013. We would like to take this opportunity to thank all the participants, volunteers, supporters and judges for your great support. 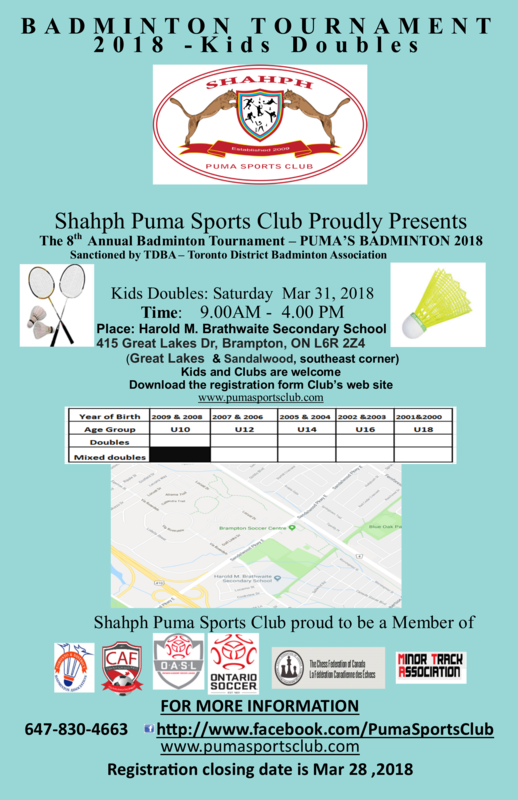 Special thanks to Pandy Chan from Toronto District Badminton Association (TDBA) for making this tournament a great success. See you all next year. Tournament photos are upload in our club's facebook page. https://www.facebook.com/PumaSportsClub. We would like to take this opportunity to thank all the participants, volunteers and teachers for their great support. Exam results will be posted on our web site as soon as all the exams are marked. All the participant's parents/guardian, please send us a test message along with your kids name and Grade to confirm your email address ( in some forms, email addreses are not clear and not legiable), so we could email your kid's mark. Do you want to promote your business in the local community? 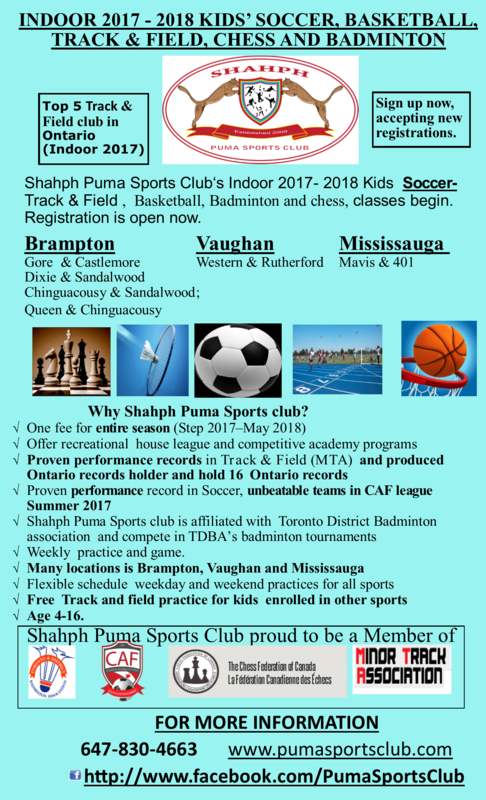 Shahph Puma Sports club proudly hosts the following annual programs.